Check out our NEW registration system! For step-by-step instructions on how to use our new system, check out our Registration System User Guide. Thank you for considering sending your child to our Engineering Expectations summer programs! We strive to provide the best possible experience for your child during their time at Engineering Expectations. In order to ensure a quality experience, we have created a variety of different programs that are suited for appropriate ages and maturity levels. If you are interested in your child learning about a specific engineering discipline, please review our Engineering Camps by Discipline Chart. Please note: You must register by 5:00 p.m. the Wednesday before your program is to begin. Prices, content, dates, and times are subject to change without notice. Payment Plans are available for these programs. Explore the world of computer programming with the Raspberry Pi - a low cost, credit-card sized computer that plugs into a computer monitor or TV and uses a standard keyboard and mouse. It is a capable little device that enables people of all ages to explore computing and to learn how to program in languages like Scratch and Python. The Raspberry Pi can interact with the outside world and has been used in a wide array of digital maker projects. 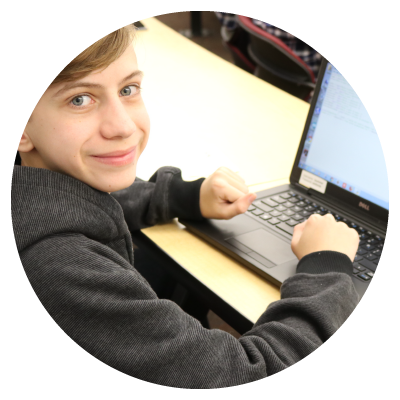 During this camp, you will work with computer scientists to build a raspberry pi computer and design multiple small projects that utilize it. On the final day of camp there will be a project showcase for parents (Friday at 11:45 am) AND you will take your Raspberry Pi home with you. Activities: Create your own computer game in Scratch, program a song using Sonic Pi, and make your very own website with your Raspberry Pi. Highlight: Take the knowledge you’ve gained along with your Raspberry Pi and electronic kit home after your parent presentation to continue the programming fun at home! Explore the world of computer programming with the Arduino - an open-source electronics platform based on easy-to-use hardware and software. Arduino senses the environment by receiving inputs from many sensors and affects its surroundings by controlling lights, motors, and other actuators. No previous experience is required as you will learn the basics of C/C++ coding and circuit construction. Learn how to control electrical components such as LEDs, resistors, motors, and LCD screens with your Arduino. 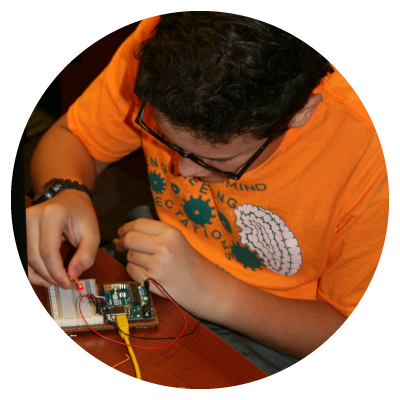 On the final day of camp, there will be a project showcase for parents, and you will take your Arduino home with you. Activities: Program your Arduino to display LCD messages and mix colors with LEDs. Highlight: Take your Arduino and electronic kit home after your parent presentation to continue the programming and electronics projects at home! Explore the world of robotics using Lego Mindstorms. You and a partner will work with computer scientists to build your robot on the first day. Then you will learn computer programming skills that will allow you to control your robot to drive in specific shapes and patterns. Continue expanding your programming knowledge by learning more advanced commands that will allow you to program your robot to navigate mazes, explore the world autonomously, and even battle other robots. Learn how to use sensors to create an even smarter robot. Compete in some friendly competitions throughout the camp. Make a drag racing robot, program your robot to follow a flashlight, and shoot a basketball. On the final day of camp, you and your partner will demonstrate your robot in a parent presentation. 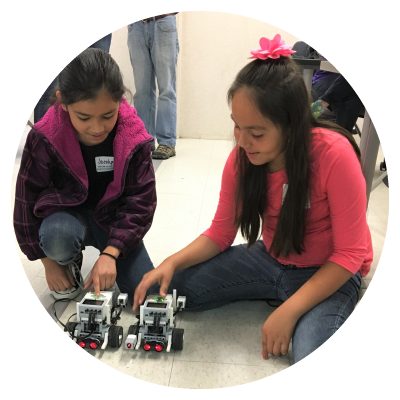 Activities: Create an autonomous robot that explores the world using a touch sensor, program your robot to follow a line using a color sensor, and complete our navigation challenges. Highlight: Build your own “battle bot” and participate in our battle robot round robin competition. 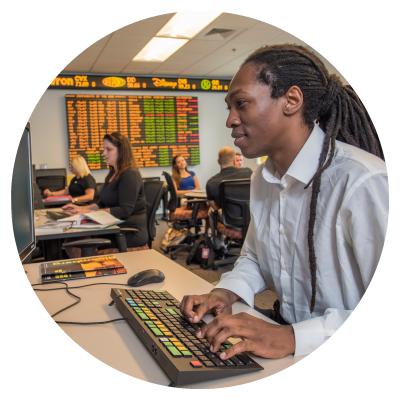 Are you looking to develop your programming skills? 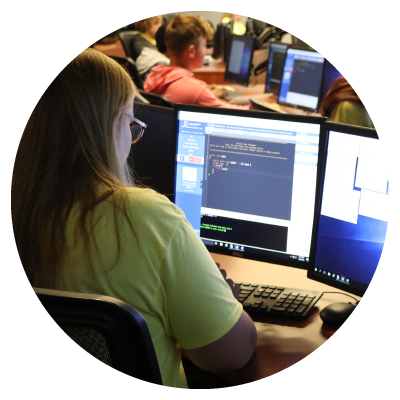 Join us this summer as we explore the fundamentals of an in-demand coding language in our NEW Playing with Python summer camp! No previous coding experience is required as you will start with the basics of project-oriented programming with Python. Learn how to store and manipulate data. Code functions to draw shapes. Design interactive games, like "Magic 8 Ball" and “Hangman." On the final day of camp, there will be a project showcase for parents. Students will receive flash drives to take home project files after parent presentations. Activities: Create your own game with graphics and a scoring system. Highlight: Learn to program games using python. Coding skills are becoming more critical in the 21st century. Our NEW Joys of Java camp will help take your skills to the next level. No previous coding experience is required as you will start with the basics of project-oriented programming with Java. Explore how computer scientists encrypt data with modern cybersecurity techniques. Learn about artificial intelligence and create interactive games. Highlight: Learn to program games using the Java syntax. Are you ready to be the coolest kid on the code block? 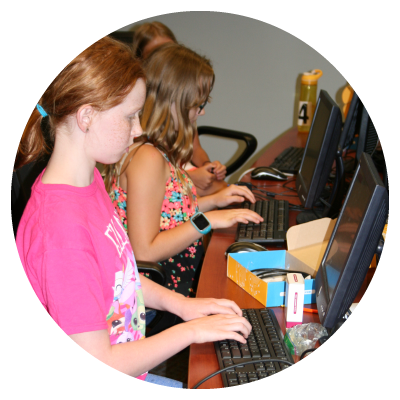 Challenge your programming skills at our NEW Webmaster Jr. camp this summer! No previous coding experience as we will start with the basics of front end languages like HTML and CSS. Learn how to create an interactive website with multiple user inputs. Incorporate graphic design techniques with Photoshop and Adobe XD. Analyze use interface designs across various platforms. Activities: Design a professional website that highlights your coding skills! Highlight: Learn from Professional Web Developers and Computer Scientists.